This research is focused on the joint work done by unions and NGOs to protect and guarantee unionists’ rights in Colombia. 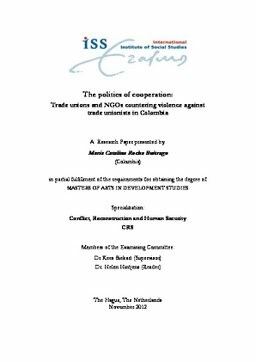 It aims to demonstrate that alliances between both organizations in countering violence have been influenced by the logic of international rights defense in the late twentieth century. By conducting semi-structured interviews, reviewing organizational documents, and secondary data, it was found that rights based approaches to development, donors’ aid, and international human rights networks have played a role in alliances development. It was found that in this context alliances have been based on NGOs experience operating within international advocacy human rights networks. In addition, alliances are influenced by donors aid funding resulting from the NGOs rights based approaches. The conclusions draw on the impact that collaboration dynamics have had on the approaches to violence against unionists in Colombia.